Last week, the Russell Hall Community Council and the Office of Sustainability collaborated for #RussellGoesGreen, a program designed to raise awareness about the many ways that residents can make sustainable choices in the halls. #RussellGoesGreen was initiated by Russell Hall's Sustainability Auxiliary Committee - a new committee formed this semester to ensure that Russell residents are living their best sustainable lives! About 200 residents participated in sustainable trivia, completed recycling challenges, and made photo pledges to be more sustainable in the halls. While pledging to perform more sustainable actions, residents dined on treats from a popular local eatery. Did you know that eating local is a part of the sustainable life? Residents made sensible pledges, such as taking the stairs more often, refilling water bottles, and taking shorter showers to conserve water. What sustainable action can you pledge to do in the halls? 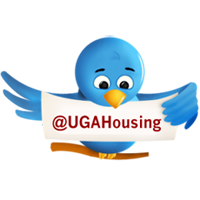 For more sustainable tips, join @UGAHousing on Twitter for "Sustainable Sundays," where we share easy-to-do sustainable actions using #LivingGreenUGA. Learn more about University Housing's commitment to sustainable living on our website. View the full album of green pledges on our Facebook page!